Cash worries facing NHS trusts in England could mean one-third face cuts in services and a half face recruitment freezes, a survey suggests. 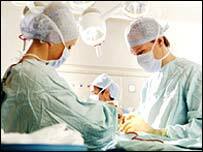 The British Medical Association (BMA) said three-quarters were facing cash shortfalls of 0.2m to £25m this year. But the government said trusts were getting above-inflation increases. A total of 120 of England's 530 medical directors, at acute hospital trusts and primary care trusts, responded to the poll by the doctors' organisation. In addition to the half who said their trust intended to implement a recruitment freeze, a quarter said their trust was considering staff redundancies. One in seven said redundancies would include medical staff. A third said funding agreements with primary care trusts had had to be changed at short notice in this financial year because of funding shortfalls, cutbacks and pressures, often at the strategic health authority level. A separate analysis of foundation trusts by independent regulator Monitor found they have a forecast surplus of £6m for 2005/06, compared to a deficit of £37m in 2004/05. The BMA first raised concerns about NHS funding shortfalls in a letter to Health Secretary Patricia Hewitt in August. "It is hard to understand why at a time when the government has invested unprecedented funding in the health service, trusts may have to lay off staff and close wards," said Dr Paul Miller, chairman of the BMA's consultants' committee. "Something is going terribly wrong when patients pay the price for these financial problems and the government's lack of joined-up thinking." But health minister Rosie Winterton said forecasts had been made of a £500m deficit for financial year 2004/05, yet the final position was an overspend of £250m - just 0.4% of the total NHS budget. "The vast majority of NHS organisations were in surplus or balance and this overspend followed three financial years when the NHS has had under spends of similar sizes," she said. She said trusts were getting an average increase of 7% in their budgets for the current financial year, and had to manage resources well and provide "value for money". "It is incumbent on trusts that in makings savings they protect patient care." Dr Miller is set to raise the BMA's concerns with Health Secretary Patricia Hewitt at a fringe meeting at next week's Labour Party conference. Nigel Edwards, policy director at the NHS Confederation, admitted some NHS trusts were having to make "tough decisions" because of financial pressures. "Although any measure which could have a direct impact on patient care, such as recruitment freezes and even redundancies, will always be a last resort." But he added: "The BMA survey was only completed by a minority of NHS medical directors and so the results need to be treated with caution." Where is the extra NHS money going?